Well it nearly the end of the week, this week in the UK children have been on holiday so it been a quiet week not that school holidays affect me anymore all my lot have grown up (or so they say lol) & have children of their own. I had a mixed week I been working on some hotpads/potholders which I am still working on & hope to show them soon, but I have started & finished a pair of trainer/sports socks for myself which you can see. 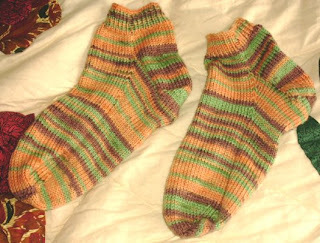 The socks are done by doing 10 rows rib I casted on 56 stitches using 3.5mm DPs knit one row then change to 2.75mm to do a K1 P1 rib until I done the 10 rows then change to knit for another 10rows then i start the heel flap & continue as I would if I was doing a normal socks these socks are great with trainers/Sport shoes when you need something on your feet but don't want ones that are longer. I also had been reading a lot & took that time for me I enjoy a nice time travel romance, I just finished Tryst in Time & Tempest in Time both by Eugenia Reiley these are set in the Old South either just before or after the Civil War, I have another book to read but not by her. Now that I have finished my socks & my new recliner sofa arrived (7.30am) this morning I will be able to put my feet up & relax when I want to be it reading or knitting. I very rarely fall asleep in a chair so the recliner won't do it but it be nice to relax in. wow I am a crocheter but have just learned to knit and joined the knitting sock group hope mine come out as beautiful as yours! !